My traveling and blogging have unlocked many doors to studio visits and interesting meets. I enjoy the comments received on each and every one of my posts. An artist from La Cienega, New Mexico has sent me weekly comments since the beginning. This is how I started a conversation and friendship with Gail Murray. Last week I found myself in Albuquerque, fifty miles from La Cienega. “I’m close enough for a trek up north,” I said. La Cienega is seventeen miles southwest of Santa Fe, this was an excuse to stop by one of my favourite places and a studio visit! After a forty minute drive, I was at Gail’s Adobe style home. I found her and husband Paul to be great people to spend an evening talking about art. Gail and Paul Murray are the quintessential New Mexico couple: Gail is a New Mexico State employee by day and book artist by night. 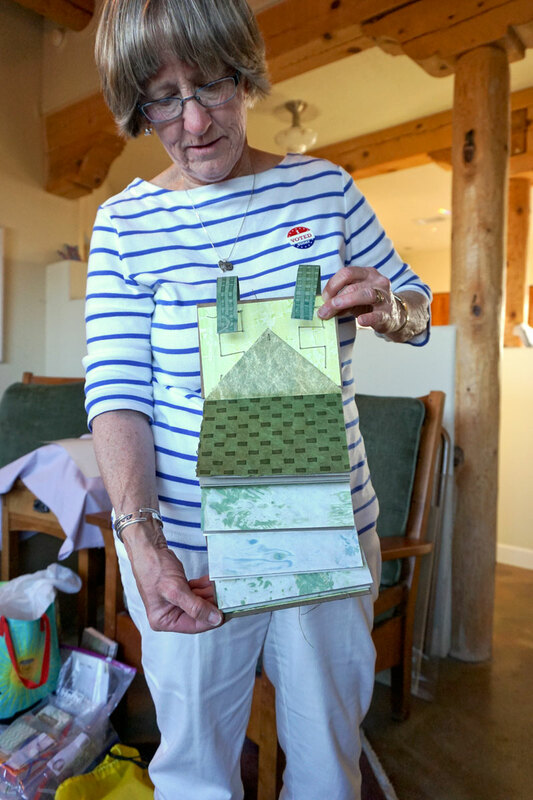 Gail makes one-of-a-kind artist books, using her own paste papers or decorative paper techniques learned through the Santa Fe Book Arts Group. Her books are filled with her own original haikus. Since 1978, Gail and Paul have made their annual Christmas cards, in a variety of media, ranging from silkscreen, collage, painting, and lino-prints. Each year they hand make and mail around 80 original, signed Christmas cards. Many people report having kept each one since 1978! Those early card years were the origins of Gail's Paw Print Press and subsequently her artist books. After viewing the BAG’s “Celebration of the Book” exhibit in late 2008, Gail instantly knew she had found her creative home. It was there she had her “AH-HA!” moment that she could BIND things into books, which had never occurred to her in all the years of making holiday, birthday and thank you cards. Paul has been a life-long, full-time artist, painting landscapes, still life, architectural, flowers or animals in pastel, oil, acrylic, or pen and ink. Paul ran his graphic design business, Murray’s Design, in Albuquerque from 1977-2003. He started painting in pastels in the mid-90s. This earned him numerous major awards and sales. With that, he was hooked, and eventually left graphic design behind, and focused on painting full time and teaching workshops. 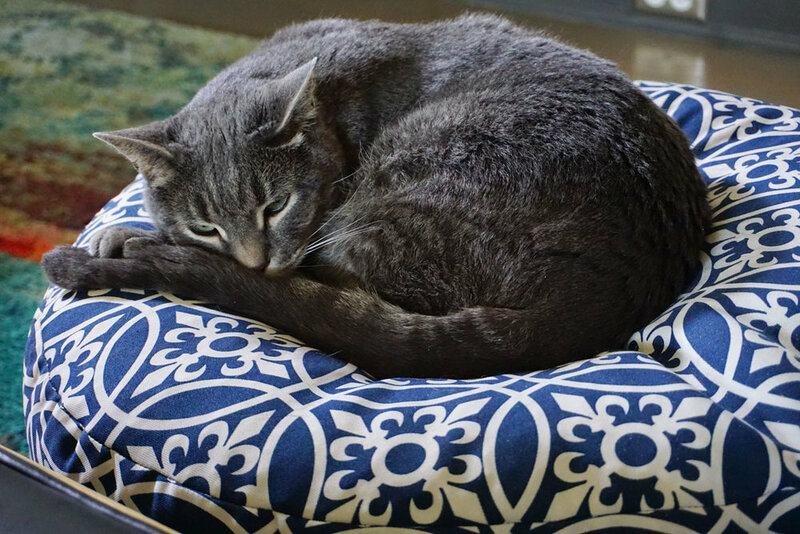 Together Paul and Gail are a collaborative team and back each other up in most matters art and the care of their current three cats, the Furry Murrays. Paul’s painting studio is connected to their home by a breezeway, and Gail produces all of her work in their spacious kitchen, with lots of spill-over into the breakfast nook, dining room, and more storage in the second bedroom. 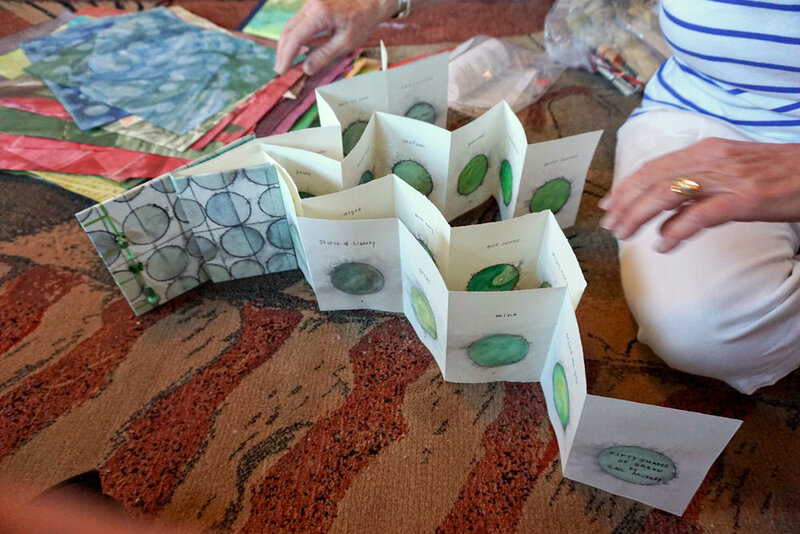 Before Gail found book arts, she says “it was a normal home. Presently it is a book art studio with cooking facilities.” The three cats reside in Paul’s studio. Their license plates say it all: CATLADY and BOOKART. The Santa Fe Books Arts Group is a very active group of approximately 150 artists. 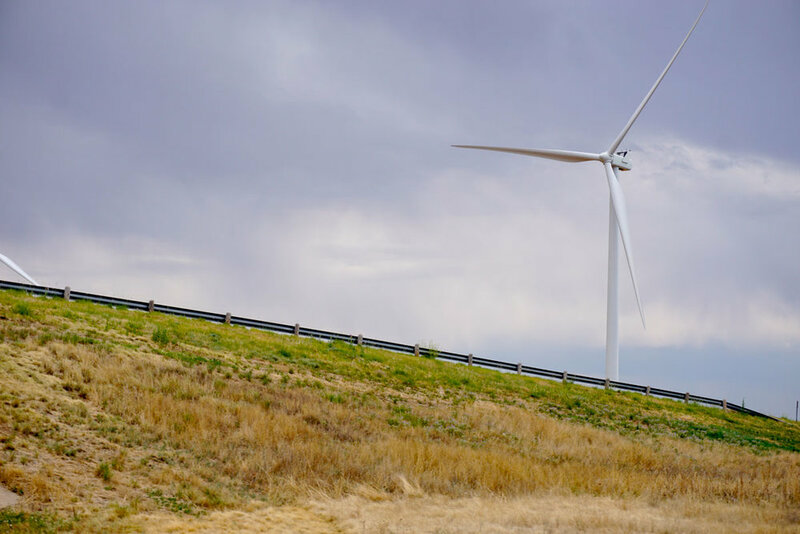 Most are from Santa Fe, however many are state-wide and out of state. The Crown Jewel of BAG’s events is the Capitol Rotunda exhibit, held every odd year for 3 months, either summer or fall at the Rotunda of the State Capitol in downtown Santa Fe. Each year approximately 100 books are accepted for the exhibit. BAG also sponsors several workshops, salons, and monthly meetings with presentations or demos given by very creative members or invited guest artists. Another highlight of the BAG year is the annual Collaborative Book. Usually, 20 to 25 members create enough pages to exchange with other members, based on the specs, theme, or colors chosen for that year’s Collaborative Book. In 2014 BAG organized several small study groups, called In Over My Head—they cover a diverse range of topics. The groups are limited to eight participants and often meet at member’s homes or other suitable location. Popular topics have been Book Structure, Zentangle, Pop-ups, Calligraphy, Collage... Each month the associates explore in a 3-hour session an aspect of their respective topic. The Book Structure group is in its 5th year with most of the original members. Members take turns teaching a new structure or technique to the rest of the group. This June, they held their Third Annual Paste Paper Extravaganza in Gail’s Garage. Seven artists created piles of lovely paste paper; they share a swatch of paste paper with each member, to create their own unique collaborative book from the paste paper they swapped. 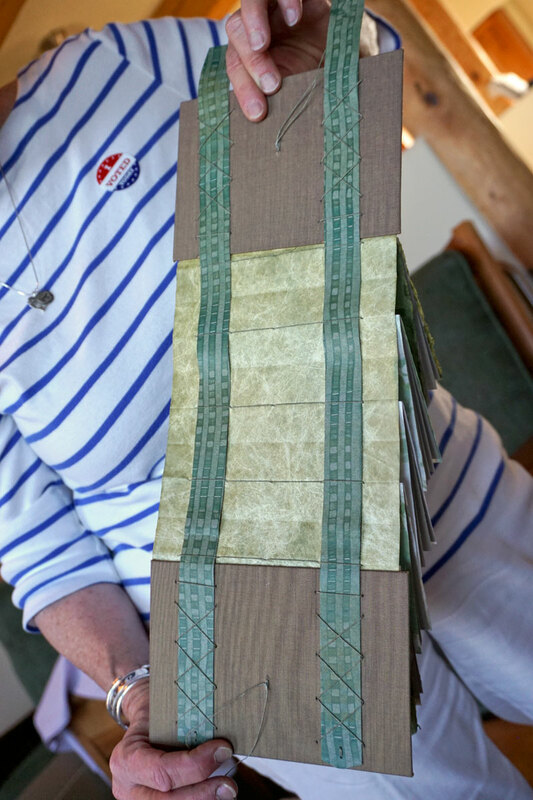 Gail showed me a Sliding Strap Concertina created during a BAG workshop by Priscilla Spitler. 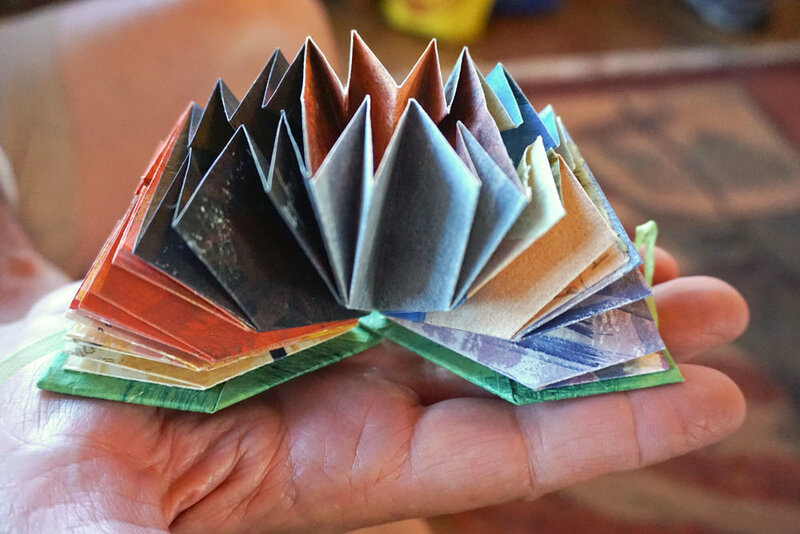 Priscilla, a fine bookbinder from Truth or Consequences, New Mexico learned this structure from Gary Frost. This intriguing book structure permits additional content in the book or the book can be displayed on a wall. The Sliding Strap Concertina is a versatile structure that expands by the straps sliding through the linen thread “loops” sewn into the front and back covers. The spine is made of stained or painted Tyvek, with the five signatures pamphlet stitched to each fold in the spine. Each signature and endpapers can be covered in paste or marbled papers, these are perfect for this book. Every visit, every conversation teaches me something new. Do you have a new binding or a new way of folding paper?